Goa is one of the well-known party place in India basically known for the western cultures and activity. 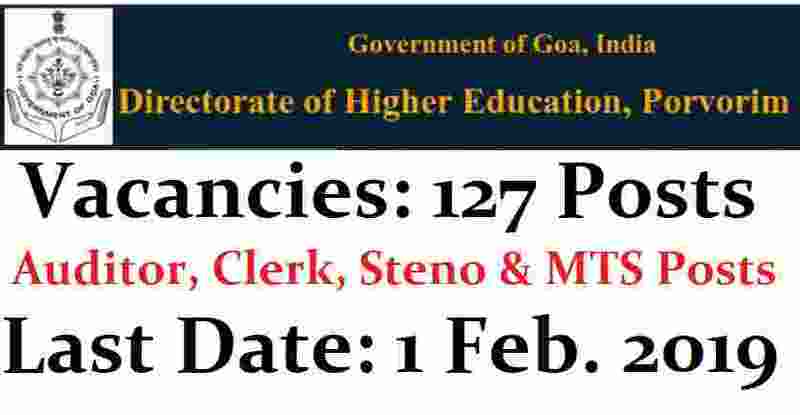 Here comes the new Government job opportunity in Goa city for various job profiles under the department of Directorate of Higher Education. So those who are looking for the Government jobs in Goa city can apply for this recruitment process. 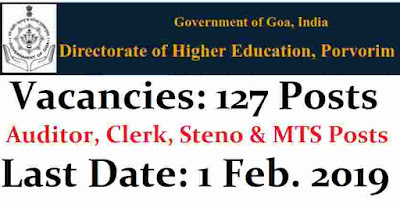 The links to submit the online applications and detailed guidelines regarding Essential Educational Qualification, age criteria, general instructions, selection criteria, etc are available on the Directorate of Higher Education website http://www.dhe.goa.gov.in as well as we also share in this job posting article below. The last date for the submission of the online applications by the eligible candidates is 01.02.2019 by 5.45 p.m. On the successful submission of online application, applicant will receive a soft copy (e-mail) containing the details filled by him/her in the online applications on the email-id provided by him/her while submitting the online application. The printed hard copy of this e-mail affixed with his/her recent self-attested passport size photograph on the space provided on the first page and also countersigned on the last page, shall be compulsorily submitted only by hand delivery in the Directorate of Higher Education on or before 08.02.2019 on working days, during office hours. The printed hard copy received after due date and also through postal delivery will be summarily rejected. The candidates already working in the Government, local self-Government, Semi-Government, autonomous bodies or establishments, or any other Department/body, establishment or Institutions being an instrumentality of the Government should send their applications through proper channel only and shall not apply online. The last date for submission of applications through proper channel is 01.02.2019. Only the eligible candidates fulfilling the criteria as per recruitment rules/advertisement shall apply for these Government jobs in Goa. For any technical enquiry for filling up online applications, Candidates may contact 9763344878/9421152501 only on working days i.e. (Monday to Friday) between 10.00 a.m. to 5.00 p.m. The Government reserves the right to cancel the recruitment process at any time without any further notice and without assigning any reason thereof. More information related to these Govt jobs in Goa is given below in this article. Pay Band: Pay Level-5 Per Month. Pay Band: Pay Level-4 Per Month. Pay Band: Pay Level-2 Per Month. Pay Band: Pay Level-1 Per Month. (i) Bachelor of Commerce from a recognized University with Accountancy and Auditing. (1) Higher Secondary School Certificate or All India Council for Technical Education approved Diploma awarded by a recognized State Board of Technical Education or equivalent qualification from a recognized Institution. Passed Secondary School Certificate Examination from a recognized Board/Institution. Age Criteria: Age limit for all the posts :- Should not exceed 45 years. The interested candidates shall submit their applications online for the posts they wish to apply by clicking on the link “Application Form for the post of Auditior”, “Application Form for the post of Jr. Stenographer”, “Application Form for the post of Lower Division Clerk”, “Application Form for the post of MTS” provided on the website of the Directorate of Higher Education i.e. www.dhe.goa.gov.in. The last date for submission of the online applications by the eligible candidates is 01.02.2019 by 5.45 p.m.
On the successful submission of online application, applicant will receive a soft copy (e-mail) containing the details filled by him/her in the online applications on the email-id provided by him/her while submitting the online application. The printed hard copy of this e-mail affixed with his/her recent self-attested passport size photograph on the space provided on the first page and also countersigned on the last page, shall be compulsorily submitted only by hand delivery in the Directorate of Higher Education on or before 08.02.2019 on working days, during office hours. The printed hard copy received after due date and also through postal delivery will be summarily rejected. 2nd Feb. 2019 is the Last Date to accept application.